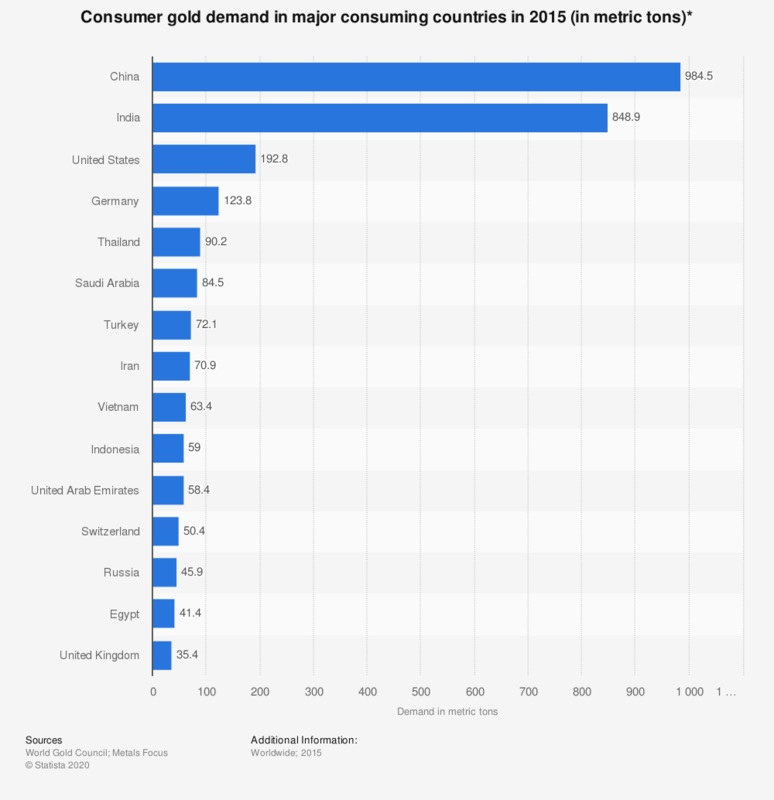 This statistic shows the gold consumer demand in 2015, sorted by major consuming country. In that year, China topped the list of major gold consuming countries by demanding approximately 985 metric tons of gold for consumption. By comparison, world gold production from mines in 2015 was estimated to have been some 3,000 metric tons. Gold is a very valuable and widely used metal worldwide. In addition to its attractive appearance, it has properties that make it suitable for many important uses beyond jewelry. These uses include electronics (due to its conductivity and resistance to corrosion), dentistry, glassmaking, other industrial uses, and more. Gold bars and coins are also used by many banks and individuals as a means of investing due to its limited supply and high value. In 2015 the consumer demand for gold in the United States stood at some 193 metric tons, while the estimated actual consumption in 2015 was 164 metric tons. The jewelry industry has the largest overall demand for gold of any other industry worldwide that uses it by far, with a demand of some 2,042 metric tons of gold in 2016. By comparison, world gold production from mines in 2016 was estimated to have been some 3,100 metric tons. Gold consumption through jewelry was also the largest use of gold in China, also the country with the largest global consumer demand for gold in 2015. In the first two quarters of 2016, however, the use of gold for investment purposes uncharacteristically outnumbered the use of gold in jewelry with a demand of some 618 and 448.4 metric tons for investment in the first two quarters of 2016 respectively, versus a gold demand of some 482 and 444.1 metric tons in the first two quarters of 2016 respectively for jewelry. * Data for jewelry, and total bar and coin investments.